The Cyprus event is the key to geopolitical survival of Europe. There is a substantial difference between Russia and China. Russia lost territory and as such needs to reestablish its “empire” that it sees as territory not economic power as does China. That means that Russia harbors the desire to still occupy Europe and it will eventually succeed thanks to the Sovereign Debt Crisis where our politicians in the West are gutting the virility of our national states to maintain simple personal power. 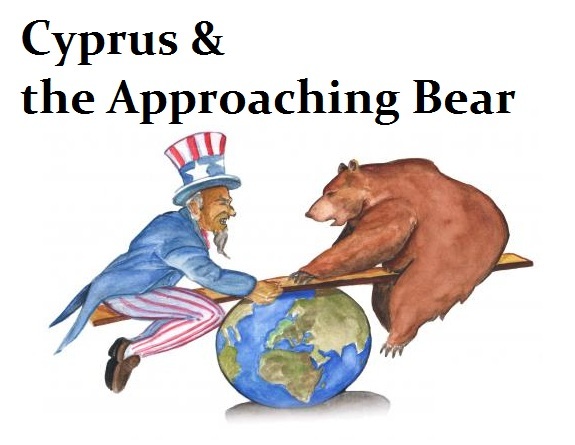 Cyprus is playing Russia off against Europe and the United States in its effort to salvage its economy and financial system because of losses in holding Greek debt as reserves. Cyprus has disembarked on an interesting strategy of playing the Russian card since Russian have a high stake in this crisis given the large amount of Russian deposits in the island. Cyprus’ banks were literally shattered by their exposure to Greek Sovereign Debt. This illustrates the problem with the Euro that lacking a single national debt resulted in the debt of all member states became reserve quality putting at risk the entire banking system throughout Europe. Cypriot policymakers are now looking at how to borrow against any future expectations of still undeveloped offshore gas fields. Cyprus has hoped that it would position itself to supply 40% of Europe’s need for gas. However, such income is still years away and delusions of becoming the Qatar of the eastern Mediterranean in the 2020s may prompt Cyprus to overplay its hand now. Cyprus must now choose between a European bailout that punishes savers for the sins of the politicians refusing to correctly structure a single currency, that would include both ordinary Cypriots and much richer Russian investors, and turning to the Russian Bear for a bailout by selling their expected future reserves in part or in whole to Russia with obvious politician strings attached. Cyprus has always tended to be a complicated island divided by a 50-year-old conflict between Greek and Turkish Cypriots. This financial crisis has ignited the most complex decisions that are now confronting the stability of Europe as a whole. The implications beyond Cyprus range begin with the risk of bank runs throughout Europe as people realize that the EU advocates just seizing cash in people’s accounts to pay for their bread-dead decisions and inability to structure Europe in a proper manner. Then there is the long-simmering conflict between the Greek Cypriots in the south and the Turkish Cypriots in the north of the divided island that could split the nation-state once again into a new military conflict. This could lead to significant geopolitical problems for whole. Before this financial crisis, most Greek Cypriots would have endorsed ever closer European relations. That is now rapidly starting to change. Greek Cypriot officials are creating a new conflict where tensions are rising with the Turkish Cypriots who want a joint approach and a share of the revenue. Turks and Greeks, along with the Israelis and their neighbors are all discovering potential reserves along their disputed borders of natural gas. This is extending the area of energy reserves beyond just the Arab world. In Washington, as well as in Brussels, there is rising new fears that increasing strains between Cyprus and Turkey could lead to confrontation and then implicate NATO. Cyprus dominated the eastern Mediterranean geopolitical concerns not so long ago. Its modern history shows that in 1878 there was the Cyprus Convention, whereby the United Kingdom took over the government of Cyprus as a protectorate from the Ottoman Empire. In 1914, at the beginning of World War I, Cyprus was then annexed by the United Kingdom. In 1925, following the dissolution of the Ottoman Empire, Cyprus was made a Crown Colony of Britain. However, between 1955 and 1959 the EOKA was created by Greek Cypriots and led to perform enosis (union of the island with Greece). However the EOKA campaign did not result union with Greece but rather an independent republic. The Republic of Cyprus was formed in 1960, however, the Turkish Cypriots were mostly Muslim accounting for only about 18% of the Cypriot population. Nonetheless, the 1960 constitution was unfair with major imbalances that favored the Turkish Cypriots that resulted in about 30% of the Parliament being controlled by the Turkish Cypriots. These unfair policies led to internal conflicts that turned into a full-fledged armed war between the Turkish and Greek oriented population. This then prompted the United Nations to send peacekeeping forces in 1964. Those forces remain still in place today. Finally, in 1974 the Greek Cypriots staged a military coup with the support of military junta in Greece. Turkey used the coup as a pretext to invade the northern portion of the island and then we see that the Turkish forces remained on the island even after there was a cease-fire, which then resulted in the partition of the island. The Turks in the north then declared in 1975 a Turkish Federated State of Northern Cyprus. The name was the changed to its current form on November 15th, 1983. Hundreds of thousands of Turkish settlers were granted the right to illegally reside in the new TRNC and were even allowed to reside on Greek Cypriot land in hopes of raising the Turkish population. This northern territory is generally considered to be occupied territory of the Republic of Cyprus. The UN Resolutions have just been ignored by Turkey. Hence, this is a powder keg is the backdrop to the risk in Cyprus – war between Greece and Turkey once again. In 2002 negotiations began for the unification of the island. Finally, in 2004 after two years both sides agreed on a plan for unification of the island. The resulting plan was supported by UN, EU and the US. The nationalists in both sides campaigned for the rejection of the plan but Turkish side accepted the plan while Greek side rejected it. Then after Cyprus became a member of the European Union in 2004, it adopted the Euro as its currency on January 1, 2008, ending the Cypriot Pound, however, the illegally occupied areas continued of the north continued to use the Turkish Lira and on January 1, 2008 the New Turkish Lira was formed. Cyprus expects about 200 billion cubic meters of natural gas worth some $80 billion at current prices which is in Cypriot waters. That amount of gas would be enough to cover around 40% of the European Union’s annual gas consumption. Cyprus has been counting on starting to export by 2018, however, this may be optimistic in the long-run. The Cypriot governments have viewed closer ties with Europe as central to their strategy to hold back Turkey and prosper as a bigger regional player. However, this financial crisis is interesting to say the least and Europe has stumbled upon a real powder-keg of their own undoing. Not merely have they shown the world that governments would just confiscate the wealth of the people to pay off debts of bankers. On the other hand, their lack of sensitivity for the historical conflicts that could easily be fueled into revolution shows the poor management by European politicians. They also failed to comprehend that Cyprus was key to also key for Europe to keen wean itself off dependency on sometimes politically unreliable supplies from Russia to boost its own security. Russia could cut the supplies at any time as part of a military conquest of Europe. Then there is the military implication for the United States. Cyprus has been used as a logistics hub to support operations in Iraq and Afghanistan. There are two sovereign bases there that are the listening post for eavesdropping on communications around the Middle East. Russia is becoming very assertive. Some realize the risk where a bailout for Cyprus will ultimately reduce Moscow’s influence on the island and elsewhere in Europe. Nonetheless, Cyprus is by no means the first indebted European member to turn to Moscow for help. Iceland turned to Russia in 2008 as its currency and banking system also imploded. This angered allies who saw a NATO member as trying to sell itself out to Russian interests. This illustrates my point. Russia could invade and take Europe when its own economic management is obviously incompetent. Cyprus, however, has long had closer ties with Moscow based on business interests, a shared antipathy towards Turkey and similar Orthodox Christian faith. Russia could easily seal the fate of Europe by gaining control of the Cyprus gas reserves. That will ensure Europe will be unable to break its dependency upon Russian energy. So pay attention to Cyrus. It is far more important than merely an unstable member of the EU.